Please note: this product is no longer available. This has been replaced by the Casella dBadge2 range. The CEL-352 dBadge Plus kit from Casella contains a dBadge Plus instrument and a 3-way charger. The 'Plus' model from Casella can perform simultaneous 'C' and 'A' weighted measurements needed for the HML Calculation to specify the correct ear defenders. The CEL-352 dBadge Plus is part of a range of different nose monitoring instruments, ideal for personal noise exposure. This particular monitor from Casella instruments can be applied for noise dosimetry in instances such as measuring personal noise exposure, assessing and monitoring noise in the workplace, ensuring compliance with Workplace Noise Regulations and selection of effective hearing protection. The display shows measurement status and data and also has a ‘fuel gauge’ display for memory and battery information. A ‘pro’ mode is available which enables projected exposure values to be displayed. The noise dosimeter also comes with an optional, ultra-bright LED action level alarm function which gives indication of when exposure action levels have been exceeded. These action levels can be configured via the Insight software and used to instantly see if noise control or hearing protection measures are needed. There is no external equipment needed to operate this sound level meter and it is simply used by the 2 keys on the side of the instrument. The standard 3-way charger can be used to manage many units. There is enough battery life and memory capacity to perform many consecutive shift measurements without charging or downloading and recharging only takes 90 minutes. Full charge gives the noise dosimeter a 28 hour operating time. 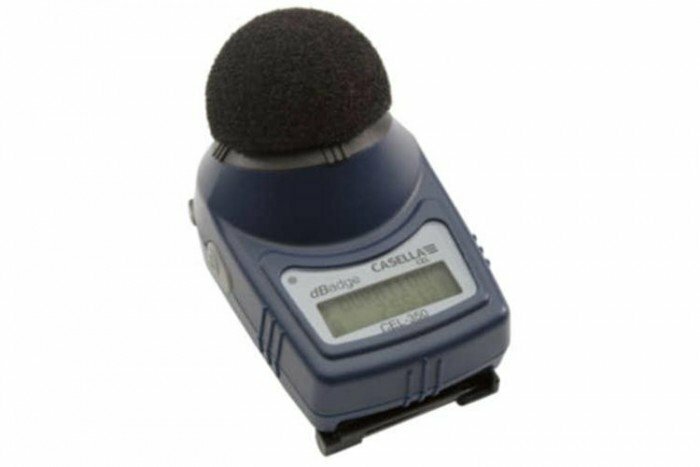 There is a choice of mounting clips combine with the light weight and size of the CEL-352 sound level meter to make it both unobtrusive and comfortable to wear on the shoulder. The clips available to the user are crocodile clips (fitted), pin clips and a hard hat mounting kit which all provide comfort and protection from dusty environments. The dBadge Plus measures simultaneous ‘C’ and ‘A’ weighted LCeq, and LAeq measurements, which can then be used to calculate the effectiveness of hearing protection by either the SNR or HML method. This data can be viewed and analysed via Insight software. ‘Pro’ mode, available on CEL-350 and CEL-352 models, allows additional exposure values to be displayed. The CEL-352 downloads to a PC automatically using Casella Insight software, simply by pointing the noise dosimeter at the infra-red download cable provided. Results recorded from noise dosimetry can be stored in a simple tree structured database, by person, place or process etc. They can also be automatically colour coded to identify exceeded noise levels and an automatic report can be generated.